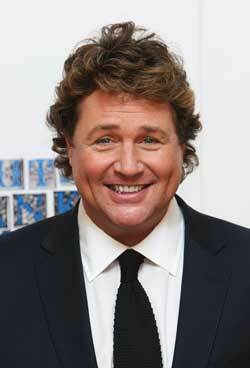 Michael Ball has been entertaining for over 25 years in London’s West End and on Broadway. He is a multi-platinum recording artist and live concert performer with performances on stage, radio and TV and in concert across the UK, Australia and the USA. His many West End credits include: originating the role of Edna Turnblad in Hairspray for which he won the Olivier Award; Marius in Les Miserables, Stephen Sondheim's Passion; Raoul (The Phantom of the Opera); Alex (Aspects of Love - West End and Broadway); Caractacus Potts (Chitty Chitty Bang Bang), Count Fosco (The Woman in White, West End and Broadway) and his English National Opera debut as Hajj/Poet in Kismet. In 2005, he made his debut with the New York City Opera in Gilbert and Sullivan’s Patience. Television includes: Michael Ball and An Evening With Michael Ball. He is often a guest presenter on ITV’s This Morning and the BBC Lottery Show. Later this year, Michael will be returning to our screens with a brand new series, The Michael Ball Show, for ITV. His 15 solo albums have all achieved gold or platinum status and his discography includes: Michael Ball, Always, One Careful Owner, First Love, The Musicals, The Movies, Music, One Voice and his homage to Burt Bacharach, Michael Ball – Back To Bacharach. He has also co-produced Love Story the Musical which transferred from Chichester into the Duchess Theatre in London's West End and has just finished the Michael Ball Heroes concert tour. Last year he appeared as Sweeney Todd in Sondheim's musical of the same name at Chichester Festival Theatre with Imelda Staunton playing Mrs Lovett. The show received rave reviews and transferred to the Adelphi Theatre in London's West End where it has just finished playing. The new DVD Michael Ball - A Life on Stage was recently released.